Val McDermid is a No.1 bestseller whose novels have been translated into more than thirty languages, and have sold over fifteen million copies. She has won many awards internationally, including the CWA Gold Dagger for best crime novel of the year and the LA Times Book of the Year Award. She was inducted into the ITV3 Crime Thriller Awards Hall of Fame in 2009, was the recipient of the CWA Cartier Diamond Dagger in 2010 and received the Lambda Literary Foundation Pioneer Award in 2011. In 2016, Val received the Outstanding Contribution to Crime Fiction Award at the Theakstons Old Peculier Crime Writing Festival and was elected a Fellow of the Royal Society of Literature. In 2017, she received the DIVA Literary Prize for Crime. She writes full time and divides her time between Cheshire and Edinburgh. “Out of bounds” is a novel in the series of the Cold Case Squad of Fife centred around Detective Inspector Karen Pirie. Even though, I did not know one of the preceding novels – “A Distant Echo” (2003), “A Darker Domain” (2008), “The Skeleton Road” (2014) – I did not have any major problems getting into the story. There are some hints to Karen’s private life in the past, she seems to have lost her partner not too long ago, but this is not crucial for the plot or to understand the character’s action. The two cases that the protagonist works on are both attractive crime scenarios: one solved by a DNA match which does not turn out to be as simple to solve as expected and going into details of biology and genetic engineering as well as legal questions about which information connected with adoptions should be provided to whom. This is found most interesting for the case since it forces you to make up your mind about such a situation and how you would opt. The second case is not too far thematically from this one since here also questions of parenthood and DNA proof pop up. Nevertheless, this is much more complicated than the first. All in all, the story moves at a high pace, shifting from one case to the other, providing a bit of information here and then going on somewhere else – this seems quite authentic in police work, since there is always some waiting time when you have to look at something different. 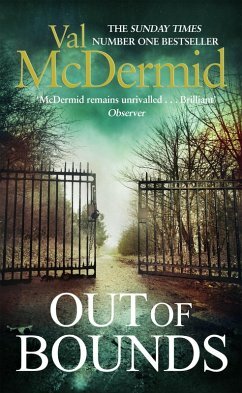 As presumed, Val McDermid manages to solve both cases without leaving and questions unanswered. As always with her, we do have another crime novel full of suspense which does not need any blood or excess of violence to get keep your attention.